1985: BADD and NCTV jointly petition the Federal Trade Commission to require warning labels on roleplaying games. The petition alleges nine cases of RPG-inspired suicide, all spurious or dubious. The FTC punts to the Consumer Products Safety Commission, which eventually rejects the petition. September 15th: A 60 Minutes anti-D&D story interviews D&D co-creator Gary Gygax and TSR public relations officer Dieter Sturm. The report treats both Radecki and Pulling respectfully and makes Gygax sound callous and evasive. 1987: In her book Raising PG Kids in an X-Rated Society, Tipper Gore, wife of then-Senator Al Gore, lists D&D as an occult teen fad and includes contact info for BADD. July 17: While D&D publisher TSR remains supine, other roleplayers finally marshall their defenses. Novelist and game designer Michael A. Stackpole, later one of the roleplaying field's most cogent and active defenders, debates Rosemary Loyocano, "Western Regional Director" of BADD on the KFYI radio network's Tom Leykis show. Stackpole says, "That was the first time we shot back in any significant way." October 12-13: "Games That Kill," Geraldo Rivera's two-part report on Entertainment Tonight, provokes gamers William Flatt and Pierre Savoie to form an advocacy group, CAR-PGa (Committee for the Advancement of Role-Playing Games). 1988: According to the Centers for Disease Control and Prevention, the suicide rate among Americans aged 10-24 levels off at about nine per 100,000. June: Editor James Lowder joins TSR's book division, a time when he considers the panic to be dying down. "I had assumed [TSR] would have been aware the worst was over," he writes. "I couldn't have been more wrong. "When I moved into my first office at TSR I [posted] copies of Dark Dungeons on the door. The pages were up for only a few minutes before [TSR vice president] Jim Ward passed by. He stepped into the doorway, pointed to the pages, and said, 'If you want to be working here this afternoon, you'll take them down immediately.' For a moment I assumed that he was kidding, but he explained that [TSR's CEO] Lorraine Williams and the rest of upper management had no sense of humor about the panic, and that I'd be wise never to joke about the subject within hearing range of any of them. "I'd soon learn that Ward was not exaggerating. 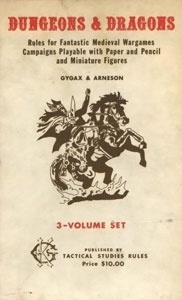 In fact, the company had become so hypersensitive to the criticism connected to the panic that demons and devils were going to vanish from AD&D with the publication of the second edition. I discovered, too, the company was attaching a rider to all novel contracts - a very slightly modified version of the old Comics Code Authority guides for editorial content. No one enforced it, though, and when I asked why, given the lack of enforcement, the guidelines were included in the contract at all, I was told they provided cover. If anyone asked, the company could hold up the list of proscribed content and say we had the same guides as the people publishing such wholesome fare as Archie and Superman." 1989: AD&D 2nd edition replaces all mentions of the words "devil" and "demon" with the neologisms "baatezu" and "tanar'ri," and similarly expunges real terms like "succubus." Unswayed by this concession, Vital Issues Press publishes Pat Pulling and Kathy Cawthon's The Devil's Web: Who Is Stalking Your Children For Satan? Clearly Pat Pulling is a "cult crime expert" only in her own eyes and those of her cronies, allies and disciples. Barry Goldwater once said, "Extremism in the defense of liberty is no vice." The extremism connected with the battle against the Satanic Conspiracy is defending no liberty. Fanaticism such as that which perpetuates a hysterical fantasy is nothing short of pure evil. The only greater evil is to do nothing to share the truth with those who might be misled by Mrs. Pulling. September 30: An investigative report in the British newspaper The Mail on Sunday discredits the core allegations in Michelle Remembers. The Mail quotes Michelle's father, Jack Proby, calling the book "the worst pack of lies a little girl could ever make up." Mail reporters Denna Allen and Janet Midwinter ask co-author Larry Pazder, "Does it matter if it was true?" He replies, "We are all eager to prove or disprove what happened, but in the end it doesn't matter." 1991: GAMA, The Game Manufacturing Association, publishes a brief, sensible pamphlet targeted at parents and reporters, "Questions & Answers About Role-Playing Games" by Stackpole and Loren K. Wiseman. 1992: CBS and NBC run two anti-RPG shows during the May ratings sweeps, both loosely based on the 1988 Lieth von Stein murder case: Honor Thy Mother (based on Blood Games by Jerry Bledsoe) and Cruel Doubt (based on the book by Joe McGinniss). These shows mark the decline of major media anti-RPG agitprop. The state of Illinois charges Thomas Radecki with "allegations of inappropriate sexual activity [...] with one of his female patients" and revokes his medical license for five years. 1993: In March Stackpole debates Thomas Radecki on Jim Bohannon's syndicated CBS Radio show. "That was the last time, to the best of my knowledge, that Radecki ever mentioned games or gaming," Stackpole says. "In preparation for the debate, I had faxed to CBS a copy of the consent decree in which Radecki surrendered his license to practice medicine and his license to prescribe drugs. A year later, CBS News used that decree in an expose where they showed Radecki acting to get blonde-haired, blue-eyed coeds to act as surrogate moms for yuppie couples."